In the post that is called ‘The Things I’ve Never Done: Part 2,’ I set five goals for myself. I made a vanilla souffle. …And it did not go well. Do me a favor: Visit Google, type in ‘Vanilla Souffle,’ and click on the image search function. Then, look at the pictures. Do you get how the souffle is supposed to look, all puffy and bursting out of the ramekin? It ACTUALLY did the COMPLETE OPPOSITE of what it was supposed to do! And NO, I didn’t slam anything or bump anything! …Then, I found it kind of funny. And I ate them. I actually have never eaten a souffle before this and, if I’m honest, it was quite disappointing. Sure, it did not rise, but that wouldn’t have mattered. It tasted like…baked eggs with sugar. If you want that kind of taste, why not make a smooth, yummy custard instead of this? So, all of this time, I’d been scared to make a souffle. Did it hurt my ego a bit that it didn’t rise? There are those people who are good at almost everything…you know who I mean? The people who are kind of scary because everything that they do just turns out great and wonderful, or they take to a game or a sport or whatever, and they’re perfect at it. Oh, this woman who I know is a doctor, but on the side, she knits opera gloves for orphans! Oh, you need to have her show them to you, but that’s nothing compared to what she did for her daughter: She sewed her wedding dress! Didn’t even use a pattern; it was her first time, too. …Yes, her first time sewing! Oh, and you know those amazing cookies in the break room? Guess who baked them! I default to ‘inept,’ and that really bugs me sometimes. Yes, this involves practice time, as well. It’s downright tiring. It makes me feel like I’m always outside looking in, which is how I’ve felt my entire life; like a puzzle piece that doesn’t fit anywhere. Don’t get me wrong: I like being the odd puzzle piece. But being inept at so many things makes it so difficult to interact with other human beings when you know, no matter how hard you try, that you will lose that cutesy board game, or that new project you wanted to try that is outside of your comfort-zone will turn out a mess EVERY TIME. Am I good at anything? Anything at all? The silence following that question is awful. Why bother? I’ll never be any good at this, so what’s the point? So what if this person is so good that it makes my skills look juvenile? I did my best, and I’m proud of myself! It was one of the best things I’ve ever done for myself. So good, in fact, that I had a revelation: I reject competition, in and of itself. It’s certainly not a popular thing to say, but it works for me. Even though I’ve made this personal progress with myself, I do become fearful of failing at something I feel I’m good at; it’s something I need to work on. Baking is cooking’s sister, so I honestly become scared to do it sometimes because I hate it when I make mistakes. 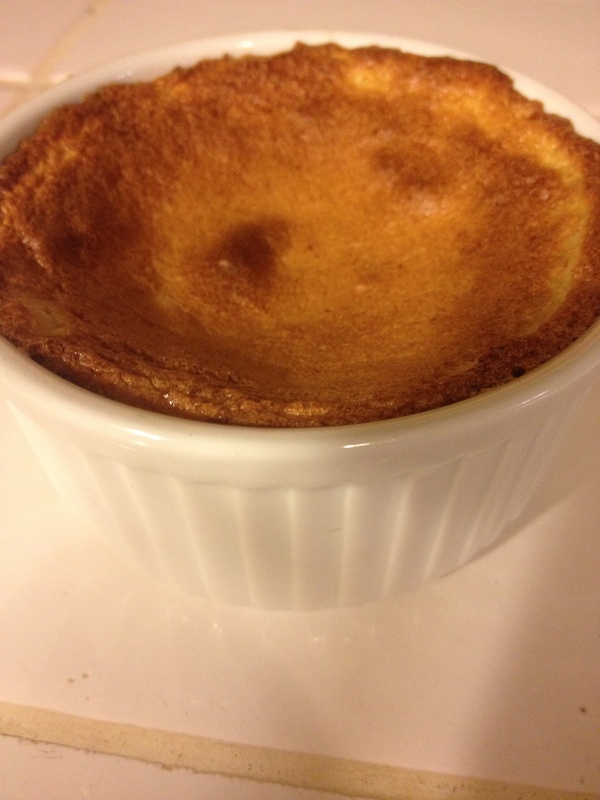 I would salivate whenever people made souffles on TV; they look SO good…but I was sure mine wouldn’t come out right. And I was jealous of the people who could make them so perfectly. But the funny thing is…it wasn’t as delicious as I thought it’d be. It looks amazing (when it’s done correctly), but I’d be almost embarrassed to serve something that tastes like that to my friends and family. Cut up some strawberries, sprinkle some baker’s sugar on them, and serve it with some angel food cake…call it a day. It is way less work, more filling, and a better dessert, anyway. Anyway…I did what I said I’d do: I made the souffle. Did what I was afraid of happening happen? This entry was posted in Fear Challenge and tagged Challenge, Contentment, Cooking, Fear, Happiness, lessons learned, life lessons, Personal Challenges, realizations, self-exploration, Souffle, Souffles, Vanilla Souffle on June 1, 2014 by lunademasi.